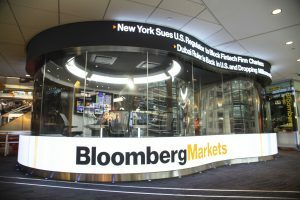 New York – Today Bloomberg launched its new state-of-the-art multi-platform broadcast studio in the heart of Bloomberg’s global headquarters in New York City, delivering a flexible, dynamic platform for multiple forms of storytelling. Sponsored by Interactive Brokers (Symbol: IBKR), the “Bloomberg-Interactive Brokers Studio” began operation this week with all of Bloomberg Radio’s live programming covering the biggest issues impacting business and finance. 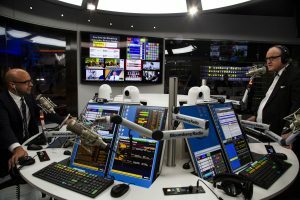 Designed by award-winning director and studio designer Roger Goodman, in collaboration with Bloomberg, the new space features cutting-edge technology allowing for simultaneous radio and video production. The space, a circular glass studio located in one of the most high-trafficked areas of Bloomberg’s headquarters and steps away from one of the only curved escalators in the world, features unique architectural elements that lend a personal feel to the radio experience. Two Information Canvases run along the outside of the space and utilize new flexible LED technology for an immersive hi-resolution display of real-time market data, news, and content from advertisers. The completely IP audio based studio is outfitted with a graphics display capability of 7680×1080 and intelligent automation for operator-less video control and presentation of story related elements, as well as brand highlights and market insights. Ten cameras are integrated throughout the space, providing a comfortable interview experience and compelling visual presentation, which will also allow for future television broadcasts. For the first time, radio anchors will have the ability to create graphs, charts, and other visual elements while on air. These elements will enhance the simulcast of Bloomberg’s radio programming on YouTube, slated for early 2019. Interactive Brokers will also sponsor an accompanying green room as an extension of the studio space, opening later this fall. “Given Interactive Brokers’ and Bloomberg’s strong commitment to technological innovation we feel that our sponsorship of Bloomberg’s new state-of-the-art facilities is a good fit for our branding and the global audience we want to reach,” said Steven Sanders, EVP for Marketing and Product Development at Interactive Brokers. “Helping to make this new studio a reality also fits with IBKR’s mission of supporting financial literacy. We believe Bloomberg’s news coverage and in-depth interviews help people better understand global markets and investing,” Sanders said. 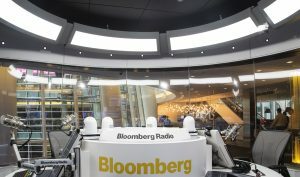 The new studio is home to Bloomberg’s marquee radio programs, including “Bloomberg Surveillance,” with Tom Keene, Jonathan Ferro, and Pimm Fox, “Bloomberg Markets,” with Pimm Fox and Lisa Abramowicz, and the newly re-launched afternoon drive program “Bloomberg Businessweek,” with Carol Massar and Jason Kelly. The new program launched August 27 and airs weekdays from 2:00-5:00pm ET. It combines daily market and news coverage with newsmaker interviews and in-depth reporting. Content from the program is produced into a daily podcast, which is distributed on Bloomberg.com, Apple Podcasts, Google, and Spotify. Bloomberg Radio is the world’s only global 24-hour business radio station. Powered by more than 2,700 journalists and analysts in 120 countries, Bloomberg Radio’s resources are unparalleled. Bloomberg Radio can be heard on its four flagship stations in New York, Washington, D.C., Boston, and San Francisco. Bloomberg shows and short form reports are also heard on over 300 top radio stations across the United States, including leading all-news radio stations in major cities from coast to coast. Bloomberg Radio can also be heard nationally on SiriusXM satellite radio channel 119, and internationally streaming live on the Internet and the Bloomberg Radio+ mobile app.